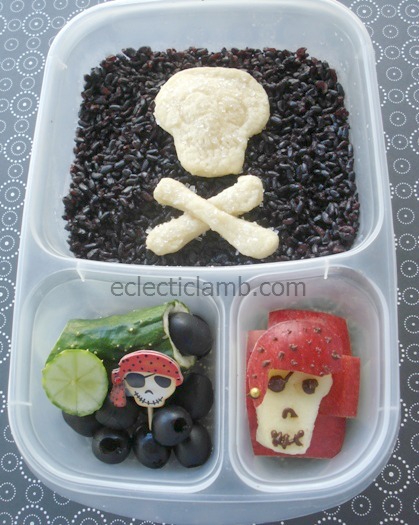 Once again I be thrilled t’ join me Bento Bloggers and buckos on this Talk Like a Pirate day bento blog hop. Please click on t’ button below t’ continue on t’ t’ next blog. Please click t’ button below t’ see t’ Nina’s amazin’ creation at Mamabelly’s Lunches With Love. After ye’ve sailed ’round this hop, hang on to yer sea legs! Click ‘ere to board t’next ship fer another hop! 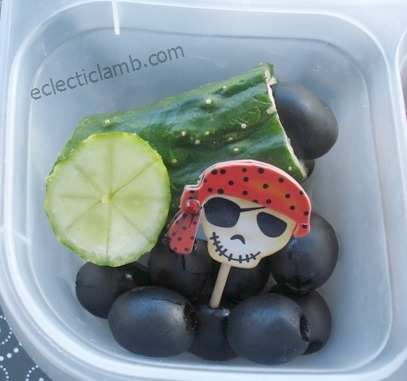 This entry was posted in Bento / Cute Food, Food and tagged bento, blog hop, lunch, Talk Like a Pirate Day, vegetarian. Bookmark the permalink. Arrr! ‘Tis a fancy pirate ya’ got there. Me loves it. Thank you, my nephew loves cannons so it is fun to figure out new ways to make them out of food. So spooky! I love all of the different skulls! Thank you Jenn! Usually I am more into cute but I do like this spooky lunch. That apple is SO amazing!!! Thank you so much Karen! I was inspired by the sticker. I love the cannon n apple pirate, so cool! Well shiver me timbers…that cannon is FANTASTIC!! Love your lunch! The cannon is so clever!! Ahoy matey! That cannon rocks, and love that you used forbidden rice! I love that apple pirate, and the gold dragee is the perfect touch! I really look forward to see what you come up with next and I must say that this is one of my favourites. Awesome bento today. Wow. Absolutely delightful. Wow! Thank you so much for your visits and kind comments! I cannot decide what my favorite part of your lunch is! You have serious pie crust skills – that skull is amazing. I love the pirate apple, too, and your olive cannonball idea. What an amazing lunch! I adore the apple pirate and love the sea of forbidden rice! What a great pirate lunch! That cucumber cannon was super clever! Love yer pirates! The cucumber cannon and apple pirate are amazing! I love the cucumber cannon. That is cool! Love the cannon and apple pirate! Brilliant touches, I love, love, love the cannon! Thank you so much! It was a case of having the correct ingredient in the house at the right time. Thank you! I was happy that the chocolate stuck to the apple. Love that pirate apple! Great lunch, hop buddy! I love the cannon! So creative! I need to try that black rice. Awesome bento. Thank you Anna! I prefer the taste of white rice to the black forbidden rice but the black rice is wonderful for dark backgrounds in bento. lol…The apple pirate is so cute! Thank you so much! I want to make more food copies of stickers. Thank you! I prefer white rice but I will eat Forbidden rice when I want a dark background.